Located south of the Tampa Bay area, Bradenton, Florida offers many chances to relax and have a wonderful family vacation. A stay at Bradenton vacation rentals avoids many of the expenses that eat into the vacation budget in an urban destination, and provides an opportunity to maximize your comfort during a family getaway. Several of Florida's major attractions in Tampa-St. Pete and Orlando are just a car ride away, but you'll find yourself enjoying the local beaches and other amenities as soon as you get there. You'll find many activities in the Bradenton area, not to mention spectacular beaches on the Gulf of Mexico, reachable by causeway to Anna Maria Island, home of Bradenton Beach. There is plenty of water to be enjoyed on Palma Sola Bay as well, near where the causeway crosses over to the barrier island. You can spend your Bradenton rentals time just taking in the sensation of the sun and the sounds of the Gulf, but in many places jet ski rentals and parasailing are available to experience the coast from a different perspective. Ride the Bradenton Beach Scenic Highway for a view of the long expanse of white sand beach and the wildlife along the Gulf shore. Bradenton vacation rentals offer the perfect balance of life on the beach and vacation comfort, since you can relax indoors compared to typical rooms in hotel and motel accommodations. 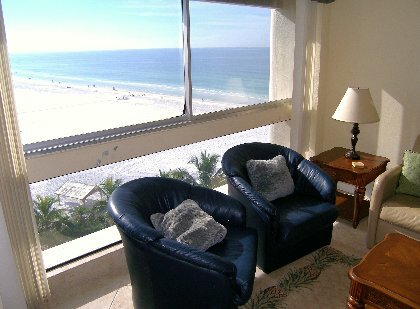 There are many other outdoor activities to set out for when you vacation at Bradenton condo rentals. Rent a bike, take advantage of boat charters, or spend some time out on a golf course. Bradenton has just about every outdoor activity covered. There is even horseback riding on the beach, a popular tourist activity, or embark on a Segway tour. Still, with so much water around, there's nothing stopping you from taking a fishing trip and catching something big in the Gulf of Mexico. Steam it, broil it, or whatever when you get back to Bradenton rentals, because you have the kitchen space to make such a delicious dinner. During a rainy day, there are still plenty of things to do. A trip to Bradenton's own South Florida Museum will provide an educational experience on the area's nature and culture. There is also an aquarium and a railroad museum to fulfill your day. An artist village features collections spread out over an entire neighborhood to get in some walking and appreciation of local artwork. While you may find comfort and delight in eating in at Bradenton condo rentals, the budget savings could be put to good use at a local restaurant or some time out on the town at night. An amazing adventure for the whole family is possible at Bradenton. Schedule some time at Bradenton vacation rentals today in order to not miss out on the interesting experience of a getaway in this Florida escape. A wide variety of alternative options for accommodations are provided by Bradenton rentals, so a pleasurable vacation can be had by all in the most suitable rental for the family. Check out nearby Anna Maria Island , Bradenton Beach , Holmes Beach , Sarasota , Siesta Key , St Petersburg , Venice .